This June, thousands of restaurants, food trucks and bars worldwide are uniting with one shared goal: the fight for a world in which every child is born HIV free. 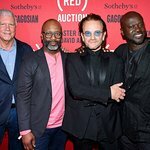 Encouraging people to join the AIDS fight by eating and drinking (RED) this June, (RED) co-founder and U2 front man, Bono, recorded a special “limerick” for his friend who’s leading the campaign for (RED), chef extraordinaire, Mario Batali. Spearheaded by Mario Batali, the second annual EAT (RED) DRINK (RED) SAVE LIVES campaign offers food fans around the world a month-long program of special events and experiences, unique (RED) menu items and social media activations, all designed to raise money and awareness for The Global Fund to Fight AIDS. It costs as little as 40 cents for two life-saving pills that, when taken daily, can prevent an HIV+ mom from passing the virus to her unborn baby. Still, 650 babies are needlessly born with the virus every day. EAT (RED) DRINK (RED) SAVE LIVES rallies the culinary world to help get that number nearer to zero. “Food is a natural convener of people, and affords families and friends endless opportunities to share stories, ideas and discuss what’s happening in the world. For this reason, EAT (RED) DRINK (RED) SAVE LIVES is as much about raising money for The Global Fund to Fight AIDS as it is about inspiring conversation and action around the table,” explains Deborah Dugan, CEO of (RED). On May 31, the campaign officially launches at The (RED) Supper – an extraordinary al fresco dining experience hosted by Mario Batali on New York City’s Pier 26. Presented by Infiniti and in partnership with Outstanding in the Field, tickets to The (RED) Supper are available on Gilt.com/TheREDsupper. Each ticket purchased can help provide at least 100 days of life-saving HIV/AIDS medication. In addition to entertainment by The Roots, the event will bring together ten of today’s most celebrated chefs who will create very special four-course (RED) menus using locally sourced ingredients generously donated by Fresh Direct. The dinner will be paired with wines from the Francis Ford Coppola Winery, and Belvedere will serve cocktails mixed with fresh juice provided by Hurom. Starting June 1, foodies everywhere will be able to eat and drink (RED) at more than 13,000 locations – from Los Angeles to London, Monaco to Mumbai and Sydney to Seattle. Supporting EAT (RED) DRINK (RED) SAVE LIVES is easy. Every participating business makes a donation to the Global Fund, and during June their customers can support a number of ways, ranging from ordering special (RED) menu items to making donations via text message. In addition, participating businesses in the US can benefit from a 50% discount on three cuts of meat from Pat LaFrieda Meats during June. •	Alongside the National Food Truck Association, Bank of America will host (RED) Food Truck Rallies in major US cities; for every food or drink purchase using a Bank of America debit or credit card, Bank of America will make a donation of 40 cents (up to $250,000) to the Global Fund. •	Chipotle is offering a (RED) Chipotle gift card online and at Chipotle locations nationwide; Chipotle will donate 5% of every (RED) gift card purchase of $25 or more (up to $100,000) to the Global Fund. In addition, to build awareness around the AIDS fight, celebrity chefs including Mario Batali and Andrew Zimmern will create (RED)CIPES for dishes that will be available on Pinterest and other social networks using the real, whole ingredients in Chipotle kitchens. •	Italian company, Alessi – known for transforming everyday household and kitchenware items into works of art – is launching a Special Edition (PRODUCT)RED collection; for each online or in-store purchase, Alessi will donate up to 10% of the retail price to the fight for an AIDS Free Generation. •	Participating US Starbucks locations are offering two (RED) menu items from June 2-June 23; for every Raspberry Swirl Pound Cake or Red Berry Cheese Danish purchased, Starbucks will donate 10 cents to the Global Fund to help fight AIDS. Similarly, participating Canadian Starbucks locations will donate 10 cents US for every Raspberry Cheese Danish and Lemon Raspberry Loaf purchased. •	Online fresh food grocer FreshDirect is creating an EAT (RED) page at www.freshdirect.com/RED where customers can order the highest quality, direct-from-the-farm food, with a portion of each purchase going to fight AIDS. •	Delivery.com is making a 40 cent donation to the Global Fund for orders placed all month. •	Belvedere Vodka, a proud partner of (RED), is celebrating the launch of EAT (RED) DRINK (RED) SAVE LIVES with a series of Belvedere DRINK (RED) cocktail events in cities across the country from New York to San Francisco and more. Additionally, Belvedere (RED) cocktails will be featured at many restaurant and bar accounts throughout the campaign. •	EAT (RED) DRINK (RED) SAVE LIVES chef ambassadors across the globe will serve up their best recipes at special (RED) fundraising dinners at their restaurants, including Sao Paolo’s Epice Restaurante, Charlotte’s Heirloom Restaurant and Sydney’s O Bar and Dining. To learn more about EAT (RED) DRINK (RED) SAVE LIVES, campaign chef ambassadors, search for participating businesses worldwide or view the global calendar of events, please visit Red.org/eat.